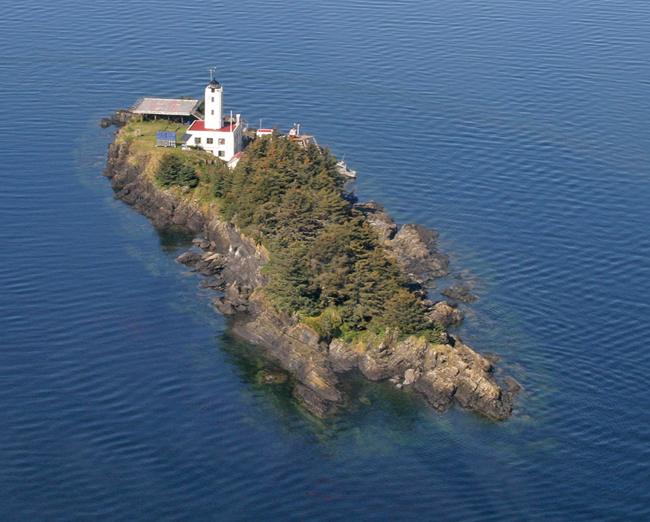 Five Finger Islands are a collection of rocky islets located in the northern extreme of Frederick Sound some forty miles from Petersburg, the closest community of any significance. These five islands, some of which are only visible at low tide, resemble a set of bony fingers reaching up from the icy waters to snare inattentive mariners. Situated along the Inside Passage, this cluster of natural navigational hazards was recognized early on as a prime site for a lighthouse. Although the United States had purchased Alaska for $7.2 million in 1867, it wasn’t until after prospectors flooded north as part of the Klondike Gold Rush, that Congress finally provided $100,000 in 1900 to start work on lighthouses to mark Alaska’s lengthy coast. 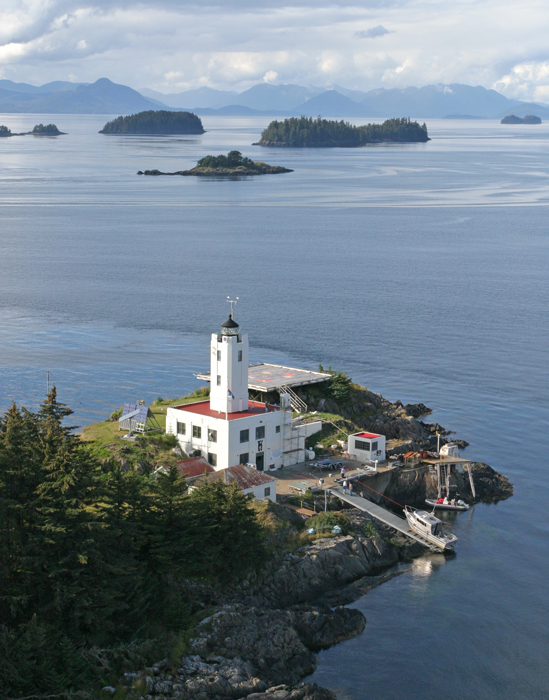 The inspector and engineer of the Thirteenth Lighthouse District sailed for Alaska on June 23, 1900 to select sites for the lighthouses, and after their return that August, they submitted a joint report recommending eleven lighthouses in Southeast Alaska and four in Western Alaska. The lights were ranked in order of importance, and in December 1900, the Lighthouse Board ordered that plans and specifications be drawn up for the top two: Five Finger Islands and Sentinel Island. 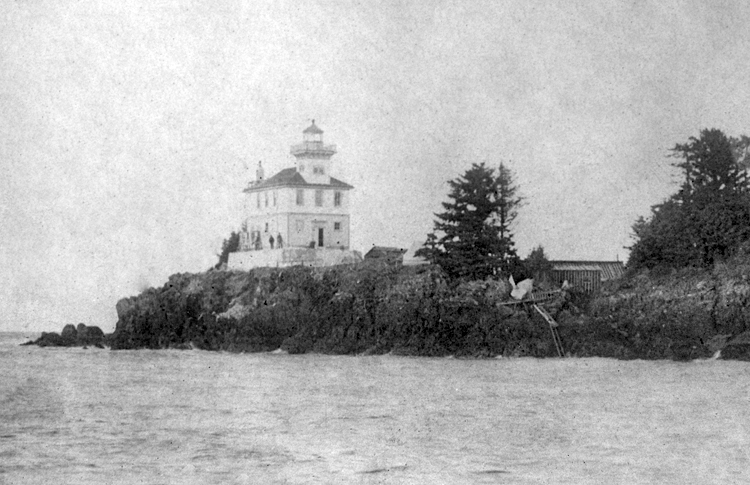 On July 6, 1901, a $22,500 contract was awarded to the lowest bidder for a lighthouse on the southernmost of the Five Finger Islands, and during the following months, a two-story structure steadily rose from its three-acre island home. A square tower, elevated several feet above the surrounding hipped roof, protruded from the southern end of the rectangular lighthouse, and atop this tower sat a lantern room from which a fourth-order Fresnel lens produced a fixed white light at a focal plane of sixty-eight feet. 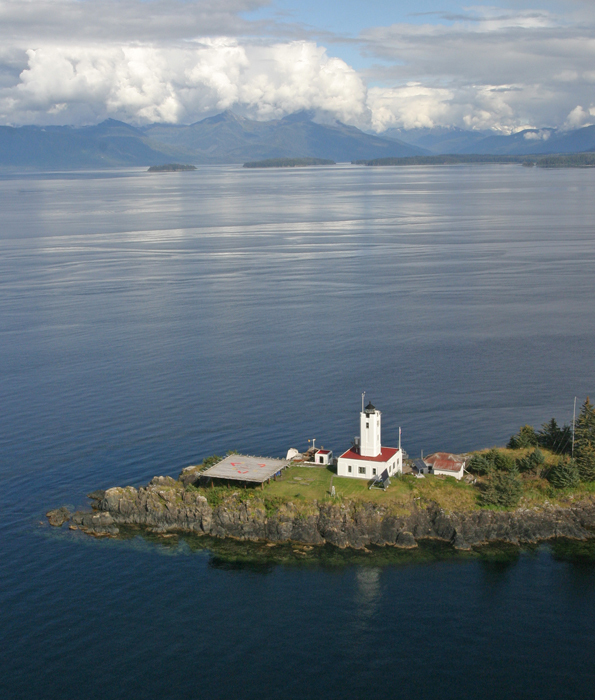 Alaska’s first two American-built lighthouses, Five Finger Islands and Sentinel Island, were both activated on March 1, 1902, however, Five Finger Lighthouse is often credited as being Alaska’s first lighthouse since its structures were completed before those on Sentinel Island. 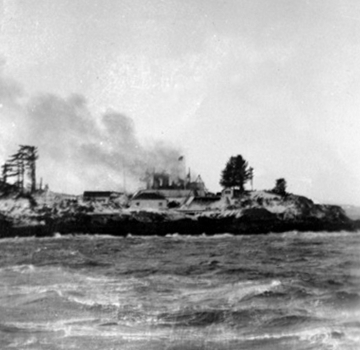 The buildings on Five Finger Islands were finished in late January 1902, and the light and fog-signal were installed the following month. Five Finger Islands Lighthouse was originally staffed by three keepers, a head keeper and two assistants. Turnover was high, with most keepers spending just a season or two on the island before finding new employment or transferring to another station. One exception was Benny Hall, who started as second assistant in 1906, worked his way up to head keeper in 1909, and spent roughly fifteen years at the station. Twice during his tenure as head keeper, Hall was awarded the lighthouse efficiency pennant for having the best-kept station in the district. 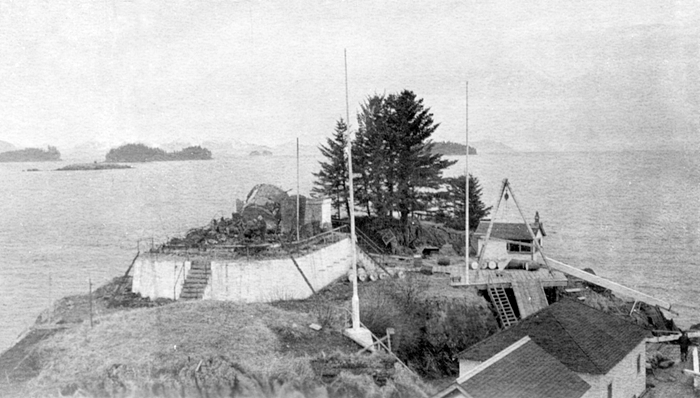 On January 6, 1903, the steamer Amur was northbound in Frederick Sound, when it was signaled by the keepers of Five Finger Islands Lighthouse. Two keepers came out to the Amur in a small boat and reported they were on the verge of starvation, having lived for the past week on just flour and what fish they could catch. One of the assistant keepers had left the station a month prior to secure food at Petersburg but had not been seen since. The Amur supplied the keepers with twenty pounds of meat and a sack of potatoes, and some passengers chipped in some tobacco. When the Amur reached Skagway, its crew publicized the keeper’s predicament. 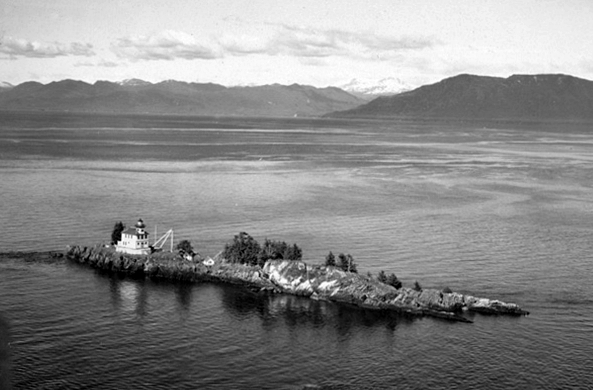 The head keeper of Five Finger Lighthouse in the late 1930s was Nick Kashevaroff, who, like Alaska, was of Russian heritage. 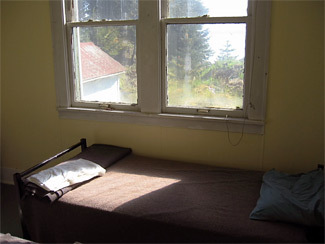 Having been raised on remote Kodiak Island, Kashevaroff adapted well to the isolated life at Alaskan lighthouses, and he served for over twenty years at such remote stations as Scotch Cap, Cape Sarichef, and Cape Hinchinbrook, with only seasonal fishermen and a few fox farmers on nearby islands as his neighbors. In 1933, the country was suffering through the depths of the Great Depression, and Dorothy Young Croman, having exhausted her savings, was forced to drop out of college. At the time, Dorothy’s younger brother Ed was working at the Patten family fox farm on Akusha Island, just over two miles north of Five Finger Lighthouse, and the Patten’s generously invited Dorothy to come live with them and provide companionship for Mrs. Patten. Island life was new to Dorothy, but she quickly adjusted to drinking goat’s milk instead of cow’s milk, and when the cold winter weather arrived, she gained an appreciation for the fur-lined seat in the outhouse. The Patten family was in close contact with the keepers at the lighthouse and visited the station once a week to collect their mail. Dorothy and Ed would often make the trip in a rowboat powered by a small engine, but only when the sea was relatively calm. 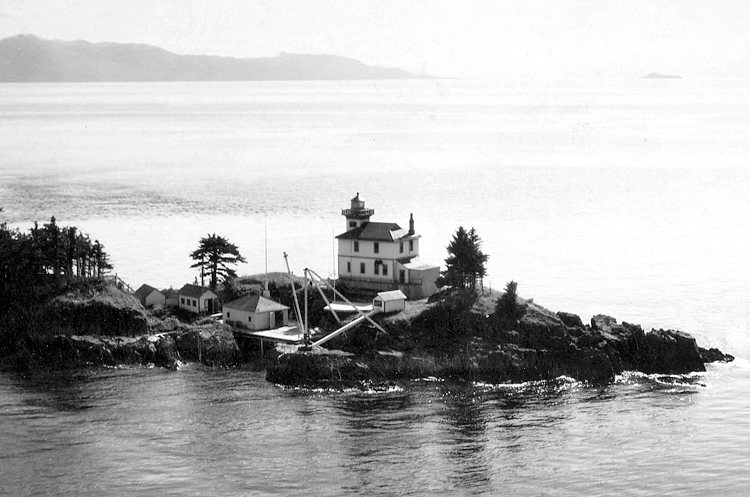 During the first week of December in 1933, bad weather settled over Frederick Sound. When the low-lying fog and clouds finally lifted, Dorothy grabbed a pair of binoculars to check on their neighbors at the lighthouse. There was just one problem – she couldn’t find the lighthouse! “I looked all around to make sure I was looking at the right spot,” recalls Dorothy. “Maybe something was wrong with my eyes. That building had to be there.” In a panic, Dorothy had her brother and the Pattens search for the lighthouse too, but it really had disappeared. “We got the boat and its kicker down from the high platform to the rocky beach, and left for Five Finger light,” remembers Dorothy. 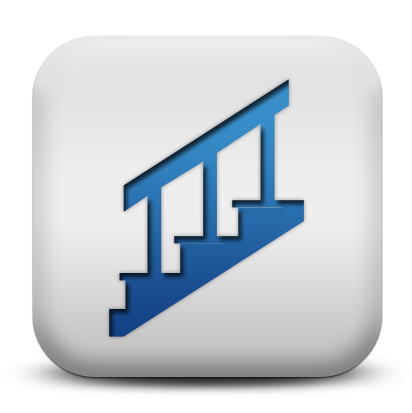 “I’ll never forget climbing up that cold metal ladder and stepping on the big rock. Shivers go up my spine even now.” All that was left of Five Finger Lighthouse was a pile of ashes, tangled pipes, and a portion of the foundation. The spell of cold weather had frozen the water pipes in the lighthouse, prompting two of the station’s keepers, Alfred Schlais and John Ellingsen, to attempt thawing the pipes with a blowtorch. The torch’s flame was quickly warming a section of the pipe, but unfortunately the temperature of the nearby wall was also increasing, and eventually it caught on fire. With their water source frozen, the keepers could do little but watch as the fire spread until the entire lighthouse was engulfed in flames. The lighthouse tender Cedar, which had been delivering supplies to the lighthouse, was anchored offshore, and its crew was dispatched to help fight the blaze. Even with the extra personnel, the attempt to save the lighthouse and radiobeacon building proved futile, but the boathouse and carpenter shop were spared. One of the keepers reportedly raced back into the burning lighthouse to retrieve the station’s logbook. Fighting his way through thick black smoke, he quickly grabbed a hefty book that felt like the logbook and made a speedy exit. Only when he was safely outside again, did he happen to notice that he had risked his life to save a Sears Roebuck catalog. The loss of the lighthouse interrupted mail service for Dorothy and the Pattens on Akusha Island. 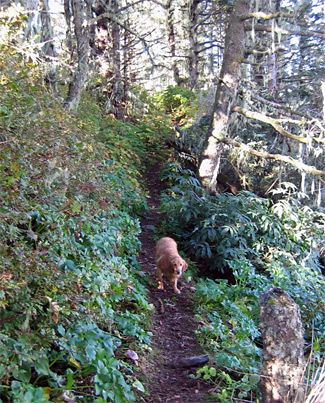 Dorothy kept a detailed record of her visit that winter in Frederick Sound, and years later, she wrote a children’s book, Trouble on the Blue Fox Islands: An outlands adventure, based on her experiences. A temporary, unattended light having the same characteristic as the lighthouse was soon established on the island. Mariners had to rely on this beacon, without an accompanying fog signal, for over two years while funds were obtained and work commenced on the replacement lighthouse. 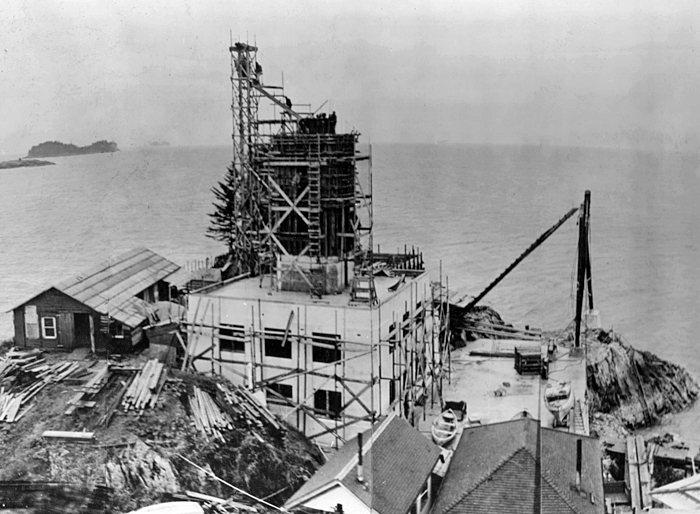 Built of reinforced concrete, the new lighthouse is practically fireproof and was completed at a cost of $92,967 as part of a depression-era public works program under the Roosevelt administration. The station was placed in commission on December 16, 1935, two years and a week after its predecessor burned down. The building consists of a reinforced-concrete structure one story high with a three-quarter basement; a 13-foot square tower extends up from the center of the building and supports a fourth-order lantern with focal plane at a height of 31 feet. The building is 40 feet square. The basement includes space for engine generators, storage battery, motor compressors, air receivers, coal room, boiler room, and a storage room. The basement doors open out onto a new concrete wharf which is so constructed that the walls form a 7,600 gallon circulating-water cistern, a 5,200-gallon Diesel oil-tank cistern, and three other tank cisterns for lubricating and fuel oils, totaling 5,200 gallons. 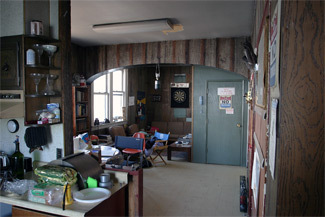 The main floor of the building contains three large bedrooms with roomy closets for three keepers, and one spare bedroom, radio room, combination living room and kitchen, and storage closets. The main floor opens out onto a porch which is level with the upper side of the island. The air from the receivers in the basement is piped to the fourth-floor landing of the tower where the diaphones and timing mechanism are installed. The signaling equipment at the station consists of a compressed-air diaphone fog signal, a radiobeacon, and an electric light. The light is of 7,100 candlepower, group flashing white every 10 seconds, shown from a fourth-order lens. 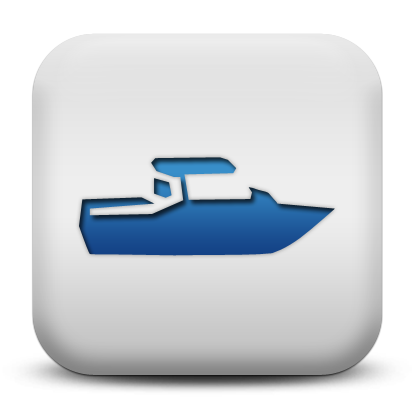 The sound fog signal and radiobeacon are synchronized for distance-finding purposes. 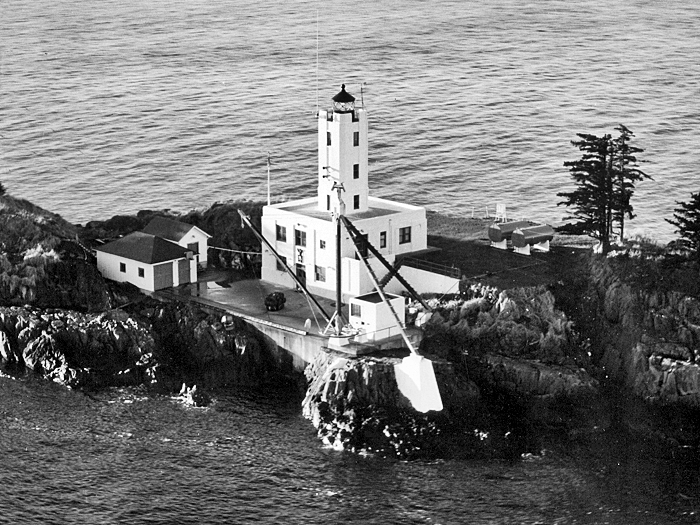 After the Coast Guard assumed control of all U.S. lighthouses in 1939, a four-man crew was stationed at Five Finger Lighthouse. Officer-in-Charge Dan Peckham, Machinery Technician Brian Dunlap, and Fireman Apprentices Steven Stoce and Kirt Whyte were the crew in April 1982. “The hard part is being away from the family,” said Peckham, who left a wife, a daughter, and a baby on the way to accept a one-year tour at the lighthouse. 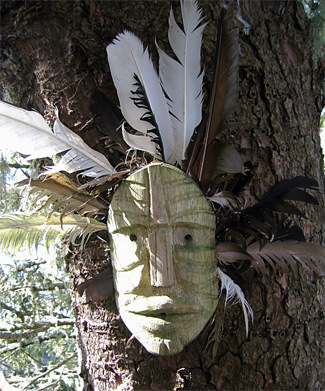 Life at the island “gives you some time to think,” said Dunlap. “You do a lot of that out here.” Dunlap also had some time to do some calculating as well, as he figured out that running thirty-three-and-a-half times around the helicopter landing pad was equivalent to a mile and that the island actual gained one acre at low tide. 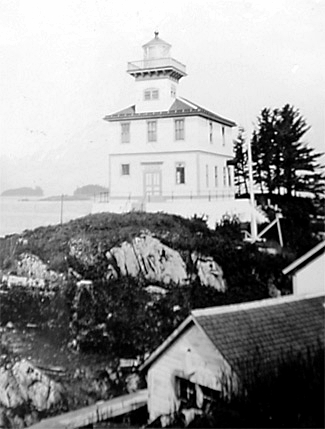 The isolated lighthouse was one of the few Coast Guard units where the men enjoyed receiving the mail more than they did their paychecks. 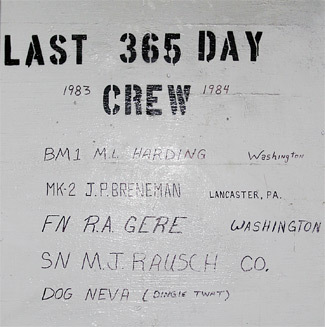 The last four-man Coast Guard crew left Five Finger Lighthouse on August 14, 1984, but it was their predecessors, the last crew to spend a full year on the lighthouse, that left behind their signatures on a basement wall of the lighthouse. 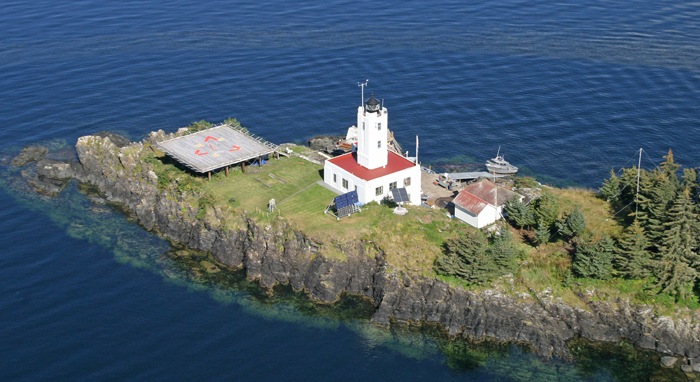 The final Five Island crew was the last to be stationed at a lighthouse in Alaska, making Five Finger the first and last Alaskan lighthouse to be manned. 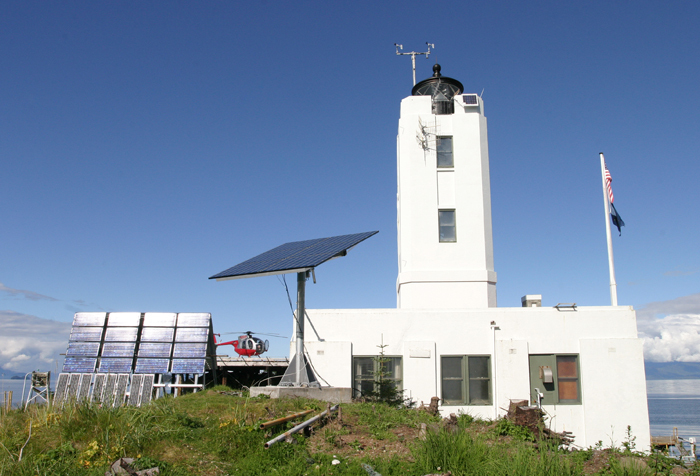 When budget cuts severely limited its ability to maintain unmanned lighthouses, the USCG Seventeenth District obtained authorization to lease its lighthouses to non-profit organizations. 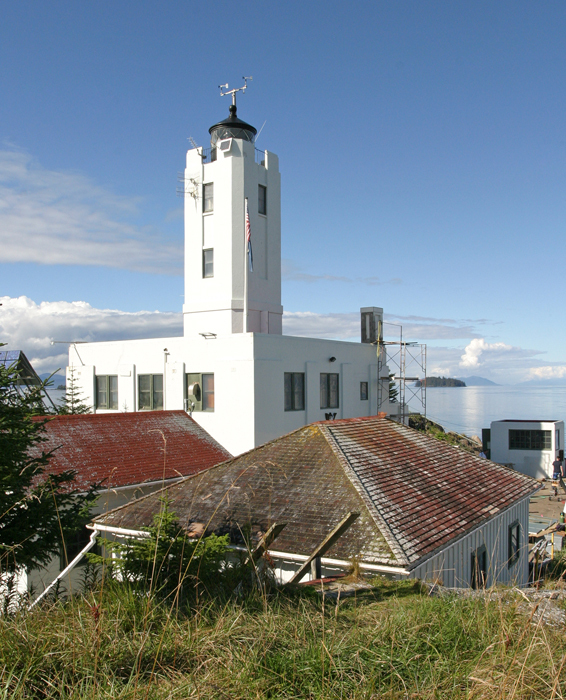 The Juneau Lighthouse Association was formed in 1997, and that same year it obtained a thirty-year lease on Five Finger Lighthouse. 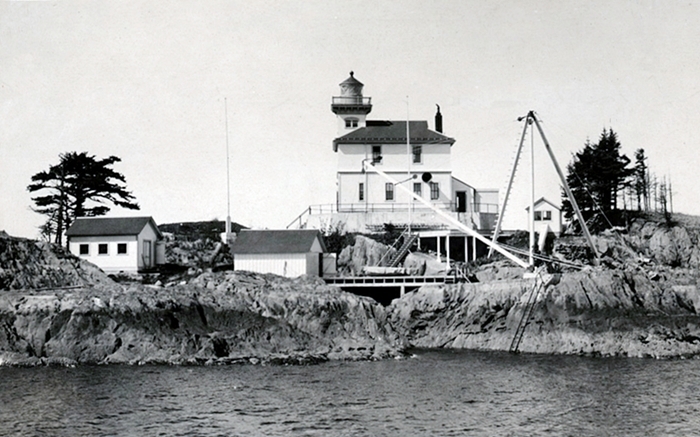 Besides the lighthouse, the original 1902 boathouse and carpenter’s shed, which survived the fire that claimed the original lighthouse, still stand on the island. 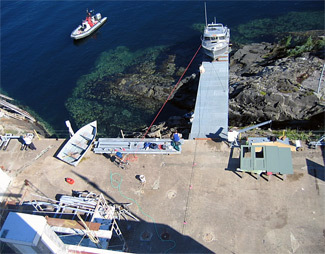 The station property was deeded to the Juneau Lighthouse Association by the General Services Administration in January 2004. 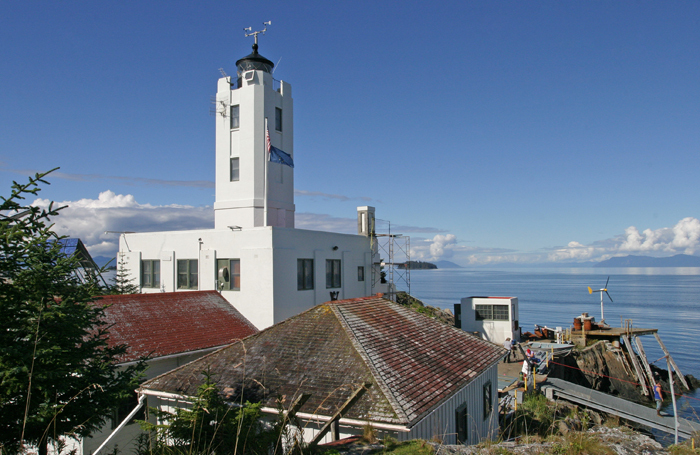 With a motto of “Use and Activity Preserves,” the association is busy restoring the lighthouse and plans to use it as a marine research site and public educational facility where guests can stay and experience the workings of a lighthouse while enjoying the amazing marine life and beauty of Frederick Sound. In 2011, members of the Alaska Whale Foundation spent five weeks at the lighthouse monitoring humpback whales and investigating how vessel noise affects the whale’s behavior and ability to communicate. On good days, the team was tracking up to 100 whales in Fredrick Sound. 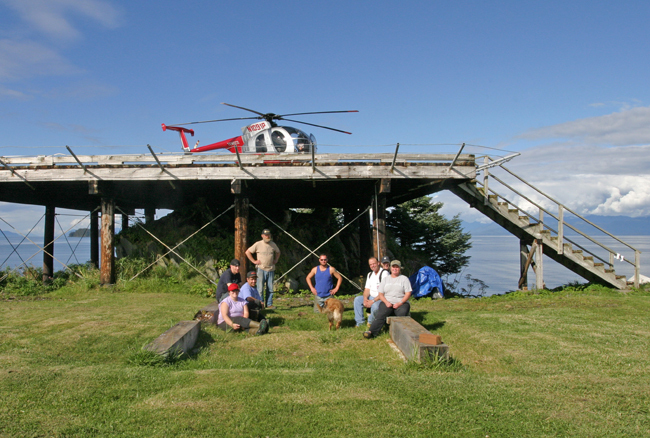 The pilot season at Five Fingers was a big success, and the foundation plans to join with the Juneau Lighthouse Association to maintain a whale research station at the lighthouse. 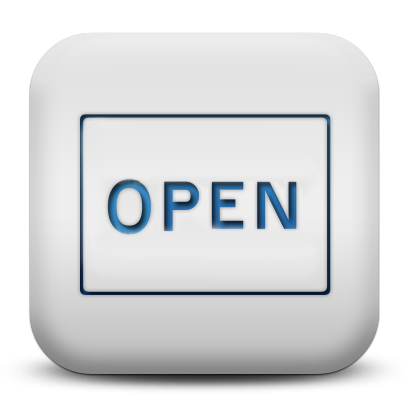 Head: Hermann Grossheim (1902), Herman G. Halkett (1902 – 1903), Charles W. Kennard (1903), Alfred W. Robertson (1903 – 1905), George L. Lonholt (1905 – 1909), Benny M. Hall (1909 – at least 1921), George West (1922), Charles P. Mercer (at least 1924), S. Olsen (at least 1927), William S. Hamilton (at least 1930), Oscar Lindberg (at least 1933), Alfred Schlais (at least 1933), Nicholas Kashevaroff (1937 – 1939), Fred H. Walker (1939 – at least 1941), James H. Scriver (at least 1940), Chuck Lott (1972), Tom Thompson (1981), Dan Peckman (1982), George Langlois (1982 – 1983), M. L. Harding (1984), Joe Seabury (1984). First Assistant: Hermann Grossheim (1902), Charles W. Kennard (1902 – 1903), Alfred W. Robertson (1903), Nils P. Adamson (1903 – 1905), Nils R. Jorgensen (1905 – 1906), David H. Somerville (1906 – 1907), Benny M. Hall (1907 – 1909), Louis Betteker (1909 – 1910), Alex Wiebe (1910 – at least 1913), Johann R.C. Claus ( – 1914), Nils C. Monsen (1914 – at least 1915), Alex Wiebe (1916 – at least 1919), Samuel P.M. Bent (at least 1921), William S. Hamilton (at least 1927), Helmes C. Exwell (at least 1930), Grant McGregor (1931), Oscar Bernhard (at least 1933), John Ellingsen (at least 1933), Henry C. Dreier (1934), John W. Gailey (1938 – 1939), George F. Rademacher (1939 –), William Gadsby (1940 – 1941), Ward J. Nettleton (1941 – 1942). Second Assistant: William K. Burntiager (1902 – 1903), Nils P. Adamson (1903), Gust J. Hall (1903 – 1905), Nils R. Jorgensen (1905), David H. Somerville (1905 – 1906), Benny M. Hall (1906 – 1907), William Russell (1907 – 1908), Louis Betteker (1908 – 1909), Alex Weibe (1909 – 1910), Elias B. Meyer (1910 – at least 1913), Nils C. Monsen (1914), Samuel L. Atkinson (1915), Samuel P.M. Bent (1915 – at least 1919), Rufus D. Blakely (at least 1921), Dan Kinnaley ( – 1927), Ray I. Loney (1927 – 1929), William J. Donelly (at least 1930), Grant McGregor (1931), C. Eltman (at least 1933), Jean P. Mestrezat (1937 – 1939), Chester N. Larson (1939 – ), Eugene L. Hopper (1940) . Northern Lights: Tales of Alaska’s Lighthouses and Their Keepers, Shannon Lowry, 1992. 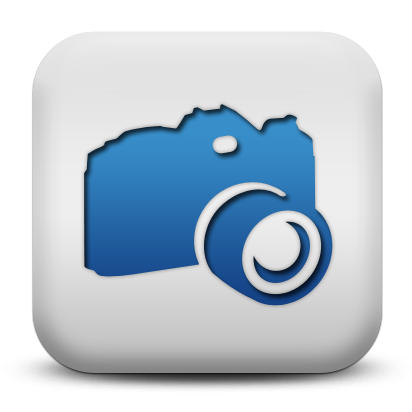 Juneau Lighthouse Association Grant Application. 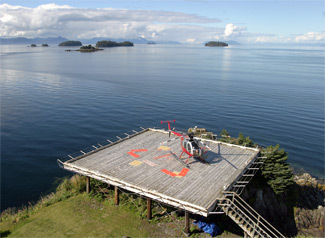 Located on an island at the northern end of Frederick Sound, where Fredrick Sound, Keku Strait and Stephens Passage meet. The islands are forty-one miles northwest of Petersburg. For a larger map of Five Finger Islands Lighthouse, click the lighthouse in the above map. 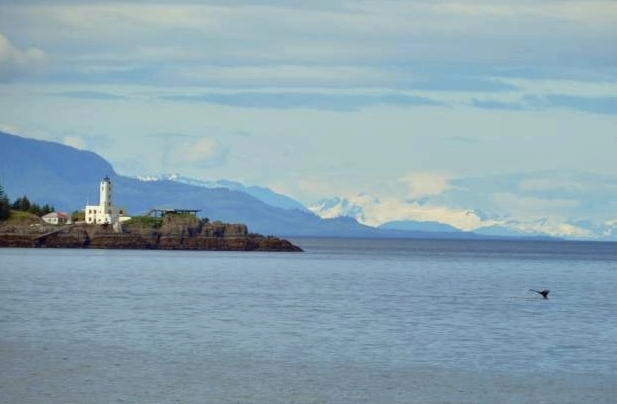 Views of Five Finger Islands Lighthouse should be possible from the Alaska Marine Highway ferries passing between Petersburg and Juneau. 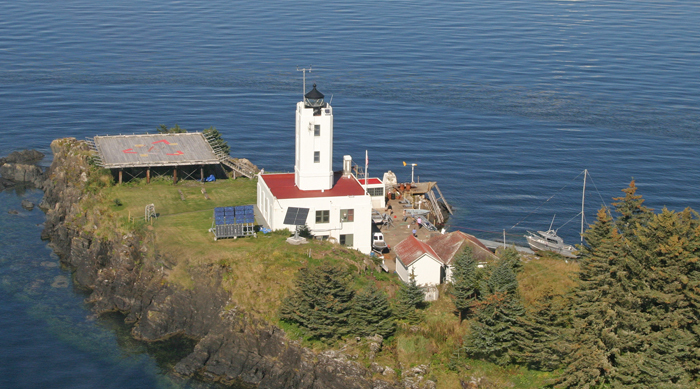 Whale watching trips to Frederick Sound out of Petersburg may also provide a good viewing opportunity of the lighthouse. We visited the lighthouse by helicopter from Petersburg. 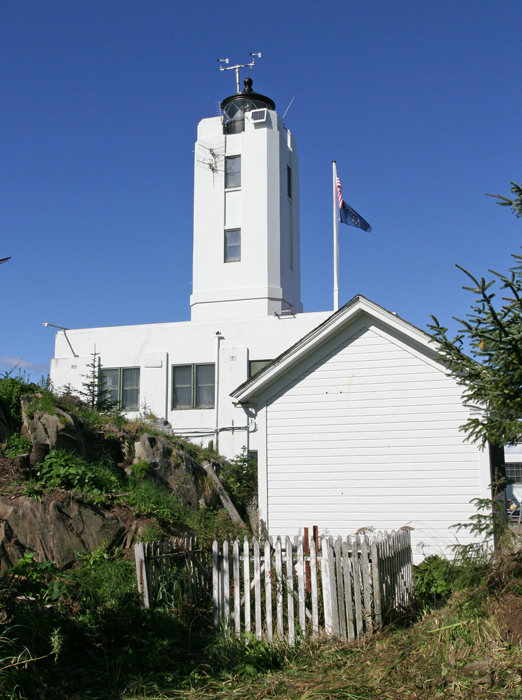 The lighthouse is owned by the Juneau Lighthouse Association. 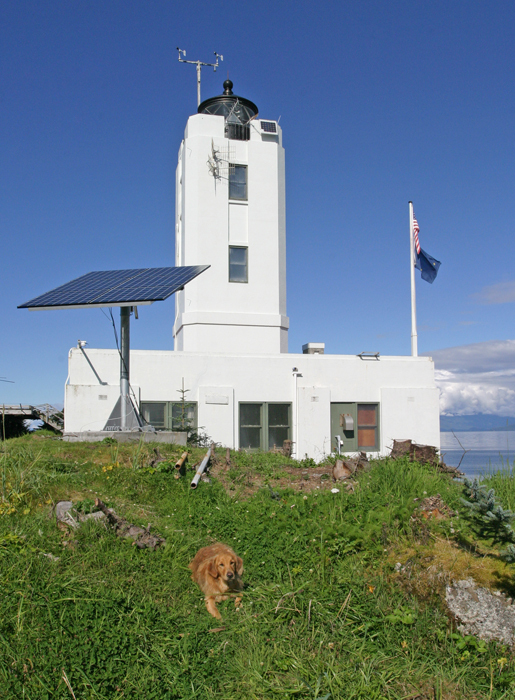 Grounds open, tower/dwelling open by arrangement with Juneau Lighthouse Association. Author Sue Henry spent a week at Five Finger Lighthouse conducting research before writing her book “Murder at Five Finger Light,” the eleventh novel in her Jessie Arnold mystery series. Reading this mystery is a great way to learn about Five Finger Lighthouse, as the characters in the novel explore every square inch of the three-acre island – the helipad, the lighthouse bedrooms and common room, the storage room in the tower’s basement, the trail to the south end of the island, the mask on the tree, the cove, platform and manhole cover in front of the tower, and the storage tanks under the platform. If you are planning an overnight trip to the island, you might want to read the mystery after your visit or well in advance to allow your mind a chance to disassociate the lighthouse with murder and death. Otherwise, if you have an active imagination, you might spend a sleepless night in Frederick Sound. This is a personal favorite lighthouse for me. The lighthouse itself, island foliage, crystal clear waters and towering mountains coupled with a pristine environment so quiet you can hear the humpback whales BREATHING and see them from every viewpoint is a mind-blowing, complete lighthouse experience.